Hot days call for cool toys. For a fun twist to the water roulette challenge, take a chance with Watermelon Splash. It's a new game introduced by YULU Toys. Players take turns spinning the spinner to determine their fate. Following the spinners' instructions, players press the watermelon against their head. 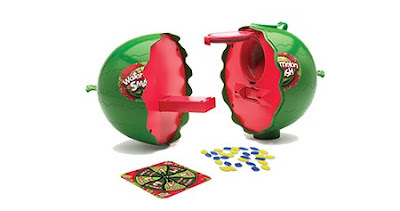 When the watermelon opens, that player is out of the game and wet with water. The plastic watermelon comes in two pieces. There is a rectangular bar on one piece and a hole in the other. When the two are connected, the watermelon is one whole piece. No batteries are required. Players take turns spinning the spinner. Whichever number it lands on is the number of times the player must tap the watermelon against their head. That's where the suspense begins! If timing is just right, the watermelon will "crack" and the player will get wet. The player who is dry at the end wins. Kids seem to enjoy playing Watermelon Splash and I love to hear them squeal in suspense, waiting to see if they'll get wet. The watermelon doesn't pour out enough water to drench someone but does pour out enough that it gets the player a little saturated. If you want to play inside, there are plastic watermelon seeds included. Instead of water, the seeds will spill out when the watermelon cracks. Will you end up dry or getting splashed when the watermelon gets smashed on your head?! That's the fun of Watermelon Splash!